Browse: Home / 2013 / January / 25 / Gluten-Free Crackers: Taste this! I’m not “Gluten-Free” as a dietary classification, but there is a stigma surrounding ‘gluten-free’ that reads: cardboard crumbles baked into sawdust loaf, and it doesn’t have to be this way. Oats, almond meal and quinoa are all in the gluten-free club, so even if your not steering clear of wheat, you can enjoy a variety of grains. Many of the wheat-free crackers I’ve tasted have rice as the main ingredient, which I don’t love as an everyday cracker. I like something a little heartier, but that’s me. Here’s three brands of crackers that made the gluten-free cut. 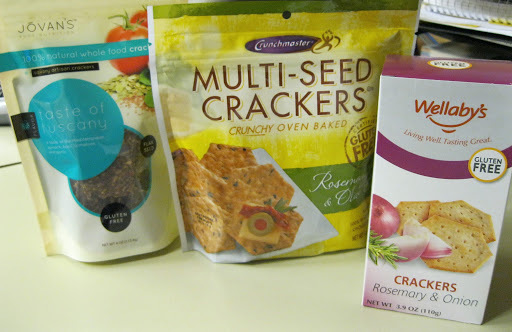 Crunchmaster: Multi-Seed Crackers – These were my least favorite because it utilizes rice as a base, which makes them airy, crunchy and a little tough. The flavor was good with essence of salt, onion and herb. Try them with a dip or hummus, not so much in a cheese and crackers spread. 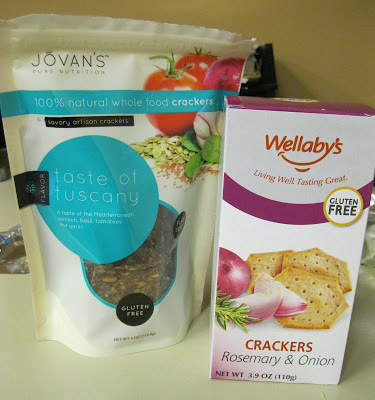 Jovan’s Savory Artisan Crackers – SUPER hearty, a marriage between a chip and a cracker. Just eating them made me want to go on a hike. These are a flavor explosion, a little bitter but oddly addictive. The ingredients are real and whole. I haven’t tried it, but they might make the most interesting Mediterranean nachos you’ve ever had. Wellaby’s Crackers – Think Goldfish crackers morphed by Edam cheese, producing an absolutely delicious savory cracker with a buttery homemade texture. Boom, you’ve got the idea. These were certainly my favorite and would compliment a savory/sweet cheese assortment or simply eaten as a snack.